The Walhalla Plateau is the southernmost part of the Kaibab Plateau, connected to the North Rim landmass by a narrow stretch of hillside around the very upper end of Bright Angel Canyon. It forms the eastern horizon when looking out from the main north rim visitor area around Bright Angel Point - a flat, densely wooded mesa ten miles across, and although the paved road to Cape Royal passes all along the east edge, the west rim and all the central area is rather inaccessible. The plateau is crossed by several old logging tracks but these have been closed to vehicles for many years, and seem to receive little or no foot traffic either. There are five named points along the south edge of the Walhalla Plateau - Komo, Obi, Ariel, Francois Matthes and Honan, of which the latter is easiest to reach, by walking cross-country for 2 miles, starting along the short trail to Cliff Spring. The other points would need longer walks, of up to ten miles. 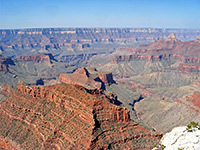 Panorama of the Grand Canyon from Honan Point. The small parking area for the Cliff Spring Trail is 0.4 miles before the end of Cape Royal Road. The path descends a wooded ravine, meets a larger drainage then turns downstream to the left, reaching the spring after half a mile. The quickest way to reach Honan Point is to first walk up this larger drainage, bearing left at the next two junctions, until the streambed becomes very shallow, on top of the plateau. The ravine is mostly clear of undergrowth, and not too steep. One of the disused forest tracks runs by just west of the upper end of the drainage - now just a faint, grassy path through the woods and blocked by many fallen logs, this looks not to have seen any vehicles for many decades. 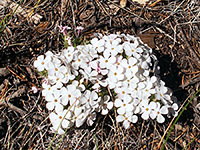 The route to the point is completed by crossing the track and heading just north of due west through the open, mature pine forest for 1.5 miles; across a small drainage, around the head of another, over a bigger valley then finally turning south, walking now across treeless land bearing scattered bushes, yucca and cacti, as the canyon rim approaches. There are several good overlooks all around the plateau edge, which is formed of flat blocks of white Kaibab limestone beyond which the land falls away vertically, and without any vegetation to block the expansive views. 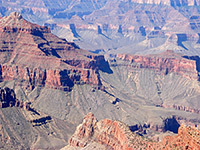 Honan offers a near 180° panorama over the Grand Canyon (see 360 degree panorama), starting in the south at the tip of the Walhalla Plateau and the detached mesa of Wotans Throne, then westwards over Angels Gate and Howlands Butte. Six miles beyond here is the most distant part of the south rim, around Grandview Point. Other features in view from Honan Point include Thor Temple, Clear Creek, Ottoman Amphitheater, and the three temples of Deva, Brahma and Zoroaster.